In 2012, science journalist Laura Helmuth, PhD wrote about Lyme disease conspiracy theories promoted by politicians such as Governor Mitt Romney, Senator Richard Blumenthal, and Governor Bob McDonnell. 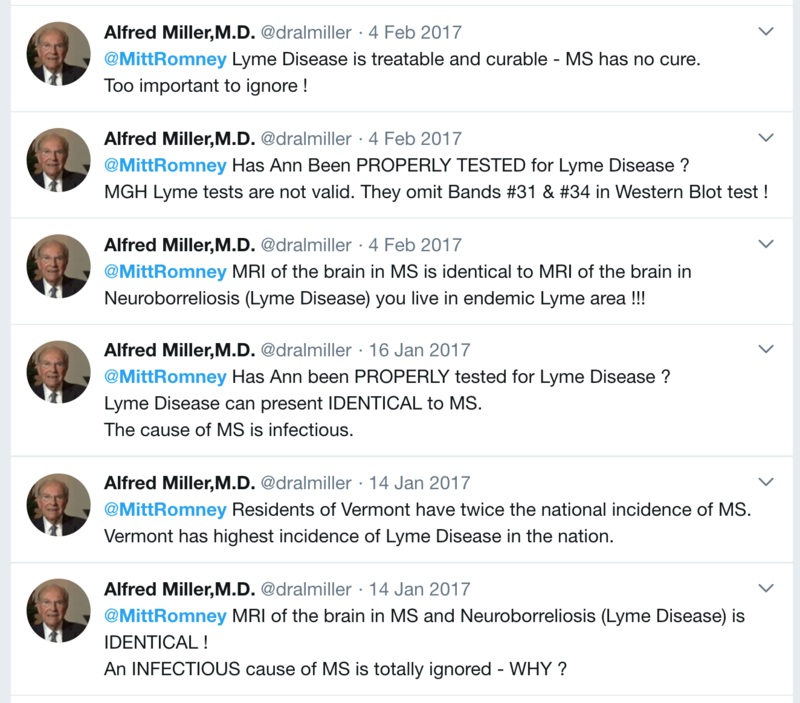 Ironically, years later, a believer in chronic Lyme disease Al Miller tried to recruit Ann and Mitt Romney into the cult of chronic Lyme by suggesting Ann’s multiple sclerosis was really Lyme disease. Alfred Miller is a retired medical doctor whose daughter-in-law tragically died of ALS (Lou Gehrig’s Disease). He is convinced that Lyme disease caused her ALS even though there is no connection between ALS and Lyme disease. A friend of one of my brothers had been suffering for years from headaches, fatigue, a sense of despair, a belief that she wasn’t worthy of her job or her boyfriend. She was diagnosed with chronic Lyme disease and was treated with antibiotics, which were ineffective. What she wasn’t treated for, and could have been, was severe depression. She killed herself. Their symptoms are real, and they deserve help. But giving them a phantom diagnosis and making them part of a crusade to bring truth to medicine just perpetuates the idea that the symptoms they describe must be part of a complex, classic disease. It’s much more likely to be depression, and depression is treatable. Jennifer Hollis was treating a fake disease with bleach rather than getting help for her depression. She took her own life. Hassett AL, et al. Role of psychiatric comorbidity in chronic Lyme disease. Arthritis Rheum. 2008;59(12):1742-9. Hassett AL, et al. Psychiatric comorbidity and other psychological factors in patients with “chronic Lyme disease”. Am J Med. 2009;122(9):843-50. Doshi S, Keilp JG, Strobino B, Mcelhiney M, Rabkin J, Fallon BA. Depressive Symptoms and Suicidal Ideation Among Symptomatic Patients With a History of Lyme Disease vs Two Comparison Groups. Psychosomatics. 2018;59(5):481-489. Zomer TP, et al. Depressive Symptoms in Patients Referred to a Tertiary Lyme Center: High Prevalence in Those Without Evidence of Lyme Borreliosis. Clin Infect Dis. 2017;65(10):1689-1694. Zomer TP, et al. Lyme borreliosis and depressive symptoms in patients aged 65 years and older referred to a tertiary Lyme centre. Eur J Intern Med. 2018;51:e19-e20.